With an objective to learn about changes in new Labour law of Nepal, Real Solutions and FNCCI jointly organized 64th HR Kurakani on the topic “New Nepal Labour Law 2074 - Brief Introduction” at FNCCI, Teku on August 30 2017. 57 HR practitioners from various organizations attended the HR Kurakani, followed by presentation from Pioneer Law Associates. Mr. Anup Raj Uprety, Managing Partner of Pioneer Law Associates briefly introduced new labour law and compared Labour Law-2048 with new Labour Law-2074. The presentation was prepared on the basis of the recently passed Labour Law, 2017 (2074) (the “New Labour Law”). It has been approved by the Parliament on August 11, 2017 (27 Shrawan, 2074) and will be effective upon certification by the President. New Labour Law applies to company, private firm, partnership firm, cooperatives, association or other organization in operation, or established, incorporated, registered or formed under prevailing laws, regardless of its objectives to earn profit or not and entity registered in foreign country but engaged in promotion of business, sale of its products or other work in Nepal (Section 90). The non-applicability sections are civil service, Nepal Army, Nepal Police, Armed Police Force, entities incorporated under other prevailing laws or in situated in Special Economic Zones and working journalists, unless specifically provided in the contract. The new law will be implemented very soon after certification by President. Maximum overtime (Section 30) is 4 hours a day and 24 hours a week (previously, 20 hours a week). Employer can even terminate their regular employees if he/she does not perform well or there is no sign of performance upgrade in certain specific time period. The benefits for trainees are same as for the regular employees of the company. Regular employment ends at 58 years of age now. And, employer can also hire an employee of 64 years of age if he/she is eligible to work. Work experience is a must for every distinct organization. An employer becomes eligible for Provident Fund from his/her first day of joining. > Weekly holiday: 1 day every week. > Public holidays: 13 days including May Day, one additional day to female employees on International Women's Day. > Sick Leave: Fully paid up to 12 days (previously half paid up to 15 days) - For those who have not completed one year of service, sick leave is provided on a proportional basis. > Mourning Leave: 13 days. This service may be terminated on the basis of seriousness of offence. The new labour law shall bring constructive changes on old arrangements of working. The organization will have to implement changes; the new law recommends businesses to change their plans, pay structures and policies that will be updated. Every participants believed that the new labour law is more broaden and systematic than old labour law. Though there are several changes on labour law, it might take some serious time to get them into actions in every organization. 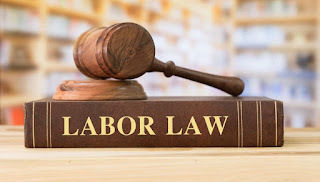 HR plays a main role on execution of labour law into action in every organization; therefore every HR must be attentive and prepared concerning the new labour law. HR learning from “HR Kurakani” is very useful and practical to implement in organization. It has been creating positive impact that has given the recognition to Human Resource personnel and whole Human Resource Department. It has been organized by Real Solutions on every last Wednesday of English calendar for about seven years.